6 Letters you will want to become familiar with. 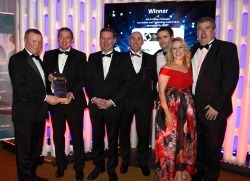 Celebrations all round, Crystal Air PCM take home Innovation and Technology Award for Thermal Energy Storage in this year’s North Kildare Chamber Business Awards 2016 sponsored by Kerry Group. 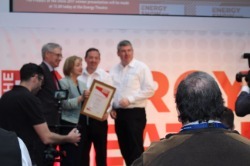 Crystal Air PCM, receive Innovation Award at SEAI Energy Show 2017. SEAI Energy Show showcasing leading suppliers of energy efficient and renewable products and services throughout Ireland and Europe. Crystal Air PCM is a group company of the Crystal Air group of companies, operating out of Clane, Co Kildare in Ireland, who have been a leader in the installation, servicing and maintenance of air-conditioning and indoor weather control systems for over 20 years, with many successfully completed projects in Ireland, the UK, Germany and Finland. Crystal Air PCM has forged a partnership with Pluss Advanced Technologies in India. Pioneers in Phase Change Materials(PCMs) with over 10 years of expertise in research and development of PCMs. The savE® range of Phase Change Materials offered by Pluss coupled with Crystal Air's implementation competency forms a strong synergy to offer sustainable and energy efficient thermal energy storage solutions. Three Park Place on Hatch St, Upper, Dublin 2, the next generation of modern development delivering 15,878 sq.m of high quality, energy efficient office space. Targeted standard for this building is designed to meet LEED Platinum.